Where did all the dungeons go? The concept of a "dungeon" in video games has gotten kind of nebulous. Let's take Dungeon Defenders II, for instance. Sometimes they're actually in a dungeon, building traps and wasting goblins who are assaulting it. They are truly defending a dungeon. Sometimes they've set up shop in a mine, which, sure. It's a little abstracted, but it's got a "dungeon-y" feel to it. But sometimes those deformed adventurers are just building stuff out in a field and waiting for baddies to come marching on. That's not a dungeon, people! 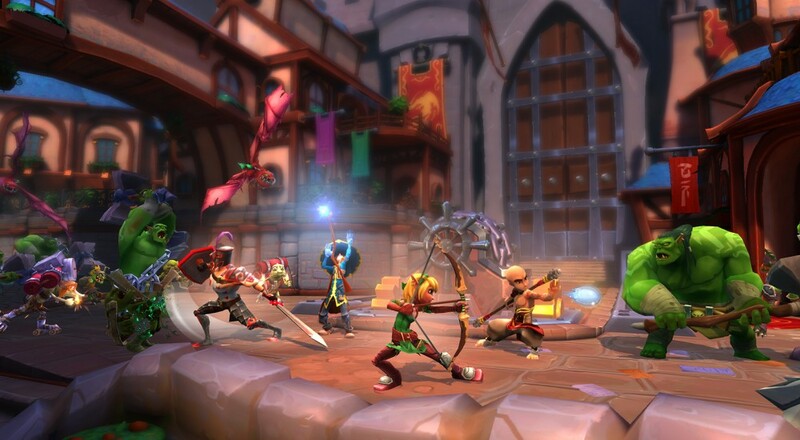 You and your friends can debate whether or not said warriors are still technically Dungeon Defenders when Dungeon Defenders II arrives on PS4 sometime later this year. Developer Trendy Entertainment has teamed up with Human Head Studios to port this four player co-op PC game over to Sony's current gen console, shiny graphics and all. Check out the trailer. You'll no doubt notice the distinctive lack of dungeons. Human Head is doing most of the heavy lifting in getting this game to the PS4. You may recall them from such titles as Prey, Minimum, Lost Within, and Rune, so they're probably experienced enough to do a port of an existing product. Maybe a new platform will give DDII a fresh new perspective on their priorities. Page created in 0.3174 seconds.